A black bear that lingers too long in a New Jersey yard may find itself trapped, prodded, then released, only to be chased by a pair of specially trained dogs. It’s a solution to the inconvenient combination of exurban expansion and bear repopulation in the city’s westernmost suburbs: As the state’s population is expanding into formerly undeveloped areas, its bear population has rebounded from 1970s lows to between 1,400 and 3,000 today. Black bears are relatively docile, but they terrify people who find them rifling through the trash. The question is, what to do about them? Hunters want to shoot the bears to keep the population in check—there have been two hunts, one in December 2003 and one in December 2005, each killing about 300 animals. But New Jersey isn’t exactly Cheney country: Many exurbanites there don’t want the bears shot to death, only chased off their land. “We made an effort to bring [the bear population] back, and now you just don’t suddenly decide to kill it because it might be fun,” says Lisa Jackson, the state’s environmental-protection commissioner, who canceled the hunt in 2006 and shifted resources to nonlethal control methods. Which is where the dogs come in. 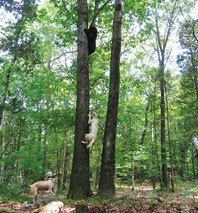 “The dogs bite the bears, wherever they can get their grip on them, in the rear end and the neck,” says Patrick Carr, New Jersey’s supervising wildlife biologist, who explains that the goal is to teach bears to avoid humans and their garbage. The dogs push them back to the woods. Bear dogs like those in New Jersey are more popular in the West, but they’re catching on around the country. New Jersey got its dogs from Louisiana, which had them trained in Montana, where biologist Carrie Hunt pioneered the technique at the Wind River Bear Institute. But Hunt questions whether New Jersey is doing it right: The dogs, she says, should never contact the bears. “I would call what most managers do aversive hazing, not aversive conditioning,” she says. “Conditioning is where an animal changes its behavior. Hazing is where you just get the animal out, but he’s going to come back, maybe not there but somewhere else. They’ll dabble in aversive hazing and then say it doesn’t work.” But whether the dogs are effective or not, it’s likely Jersey will continue to search for alternatives to hunting. According to a 2006 survey by the U.S. Fish and Wildlife Service, only 1 percent of the state’s residents like to hunt.